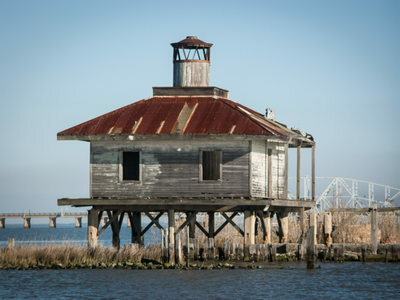 This personal gallery contains pictures of the West Rigolets Lighthouse, near New Orleans, Louisiana. 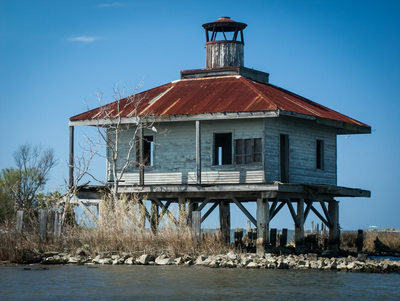 The lighthouse was destroyed by Hurricane Katrina in 2005 (not a trace of it remains), but several years prior, I had traveled out to the structure by boat and photographed not only the exterior, but the interior as well. This page was stashed away in a back corner of my old website for many years, and having transitioned to a new type of gallery site that made it impossible to directly transfer that page to the new site, I was going to just forget about it, but then decided there might be some people out there who would like to see these photos, especially the shots of the inside of the structure, as I haven't seen any other such images on the web. 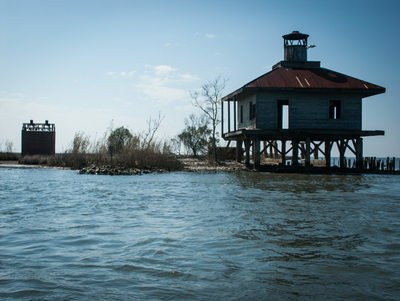 The lighthouse was built in 1855, and has the distinction of being the only lighthouse whose keeper was killed during the Civil War. He was found shot to death after just his second night on the job. 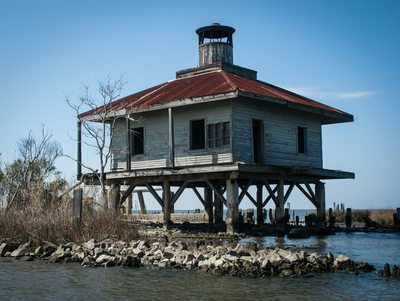 The lighthouse was deactivated in 1945, and was then sold as surplus to a private owner. 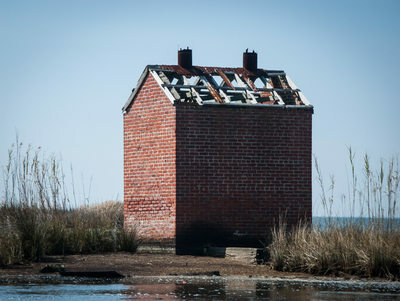 I observed on my visit that it appeared that someone had camped out in the building, and decided to build a campfire on the wooden floor, almost causing this lighthouse to meet the same fate as the Point Aux Herbes station which was located several miles away on the south shore of the lake and was burned down in the 1950’s by vandals. 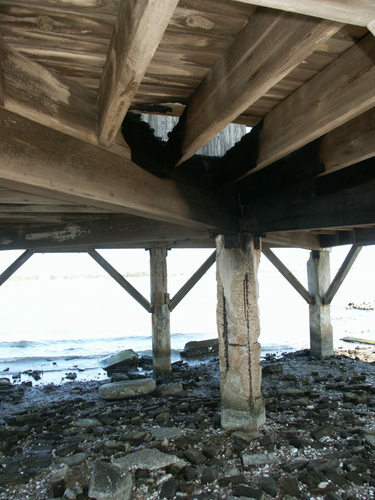 Also, the concrete pilings on which the structure rests appeared to be in poor condition, with many cracks readily apparent, and eroded concrete revealing parts of the reinforcing iron. 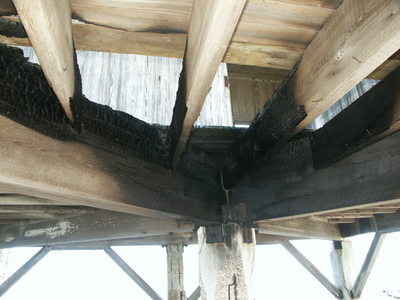 The small brick building nearby was where the lamp oil was stored. 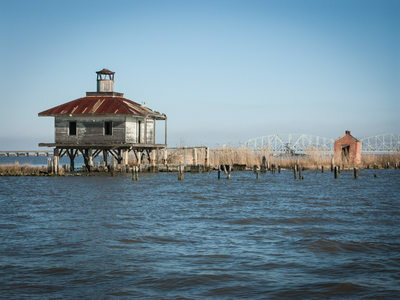 Next this building, pairs of wooden pilings receding off into the distance were apparently the remains of a foot bridge, which had allowed access by land at one time. 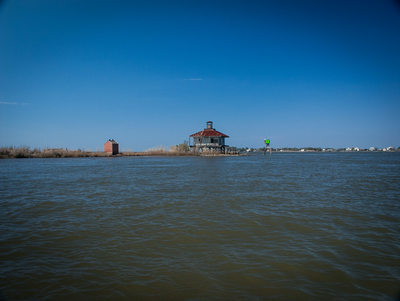 The round brick structures behind the lighthouse were based for wooden cisterns to hold the station's water supply. Also behind the lighthouse were some pilings that supported a kitchen that had been added on at some point after the initial construction (but had since disappeared at the time of my visit).